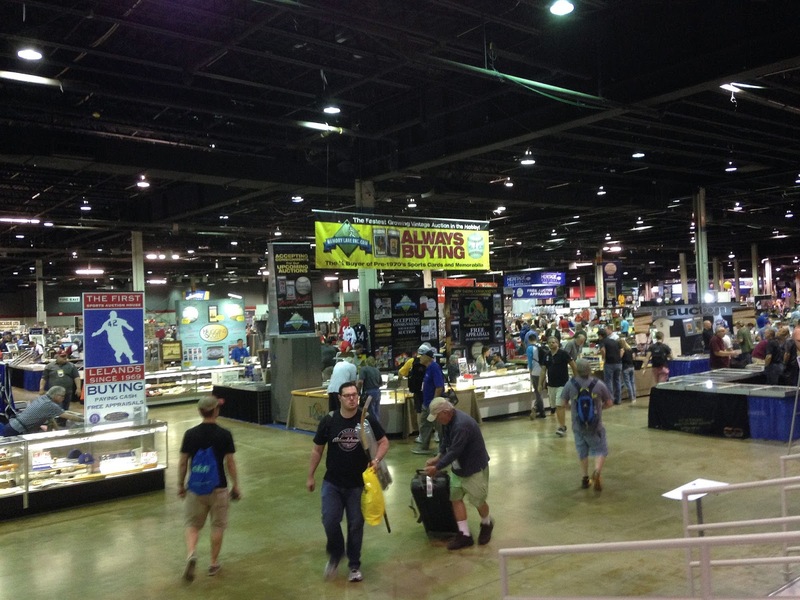 This is a weekend that has been circled on card collectors' and sports memorabilia hounds' calendars all year. 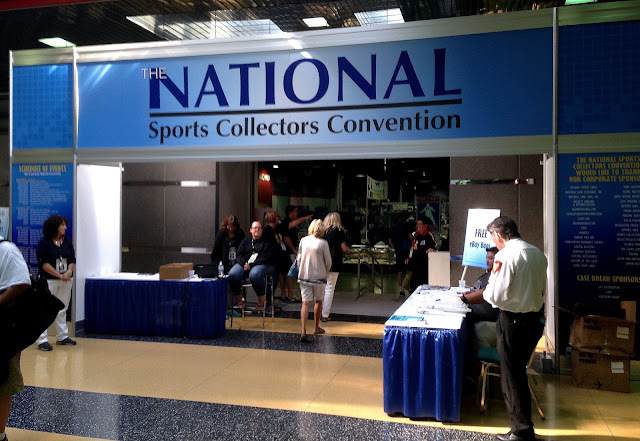 After all, it's the weekend of the annual National Sports Collectors Convention - our hobby's mecca, if you will. While many a hobbyist and vendor is flying in from all across the United States, luckily for me, this phenomenal gathering is being held in the Chicagoland area. Rosemont, IL and it's Donald E. Stephens Convention Center is only about 35 minutes away from my residence. I's sure a great many of you would kill to have this event almost literally in your backyard, yet, it wasn't until Thursday night that I decided to actually attend the annual event known colloquially as "The National." 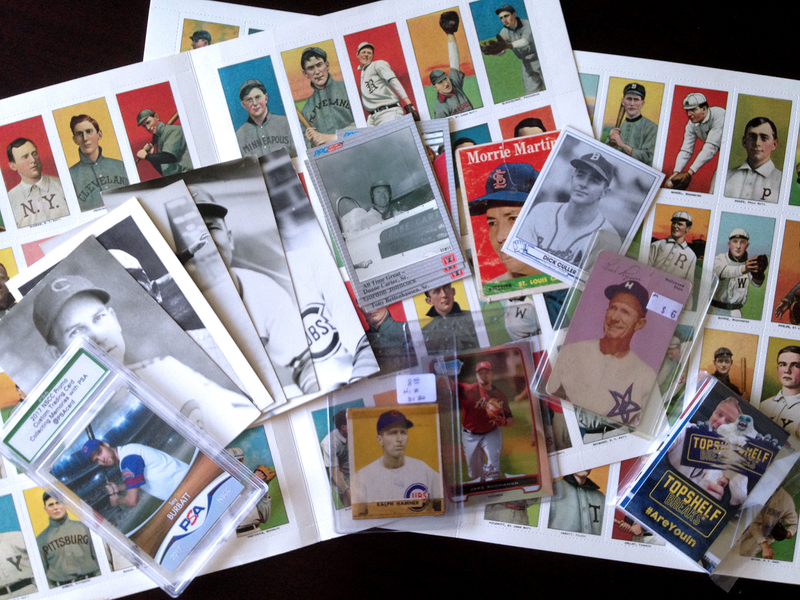 For frame of reference, despite the fact that I've been collecting baseball cards on and off since the mid-90's, I'd never been to a regular, ol' card show or swap until 2014 or 15, after I started this here blog. I generally am not a big fan of large crowds, forced socialization, or wheeling and dealing, so these kind of events (especially on this scale) cause me great anxiety. Furthermore, I'm a decidedly low-end collector with ultra-focused collecting interests. Therefore, I didn't think a convention of this magnitude would appeal to my niche CATRC or my moth-balled wallet. Boy, oh boy - was I ever wrong. Thanks to a pep talk from my lovely wife - who, when I casually mentioned the National was being held in Chi-Town the other night, immediately assured me that it would be absurd for me to miss it - I did not let this opportunity go to waste. Who knows when this heaven will be this close to me? So, despite my concerns, I hopped in my Chevy Trailblazer and made my way down Route 45 early Friday morning. I'm glad I left so early - A) there was a great deal of road construction that brought traffic to a crawl and B) I don't know what I expected, but that Stephens convention hall was absolutely massive and jam-packed with all sorts of sports goodies. The picture above doesn't quite do it justice, but you at least get somewhat of an idea. I was way to overwhelmed to remember to take pics - thanks to JunkWaxTwins for picking up the slack! Let's just say I can understand why people block off their entire weekend for this thing, rather than try to squeeze it into one day. In an attempt to at least make my way all the way through the mass of humanity and see a tad bit of everything, I know I missed of ton of great and fascinating stuff and I barely touched any of the countless discount boxes (Dime Box Nick would be so disappointed in me); however, I was so dazzled and distracted by the items I've never dreamed of even seeing in person before. Everywhere I turned, there were authentic Goodwins and cabinet cards, Deadball era jerseys and equipment, and all sorts of the highest grade vintage. But, like I said, I don't have much use or room in my budget for Aaron Rodger's autograph helmet or a Ted Williams rookie card. For a while, I was a little worried that my concerns were verified - for the first hour or so, I didn't come across much of anything that fit into either my budget or my collections. But, I tell you what, i did not leave that joint disappointed. Look at all of that pure, concentrated awesome! Stuff that would never show up in my LCS or online (at least at a price I'd be willing to pay). Turns out that while I absolutely hate doing it, I'm not a terrible haggler. After wandering about for more than six hours, I was able to secure plenty of Wrigley Roster Jenga-worthy goodies. So much, in fact, that I'm going to have to break up my "show-and-tell" posts over the course of a few days, with this post serving as a preview. I originally intended to do one, over-arching National extravaganza; but, then I realized that it would just not do the material justice. Plus, I just don't have that kind of blogging stamina, if I'm being honest. All jokes aside, this was an amazing freebie, giveaway. I don't really do the whole graded card thing; that said, if I do, I think PSA will have my business. Plus, they'll be getting some free advertising on my work desk, that's for certain. That's all I've got for today - stay tuned over the course of the next three or do days to see the rest of what may very well be my best single-day haul of my entire collecting life. All in all, I was able to add 13 new names to my CATRC binder, bumping me up almost a full percentage point (from 72.48% to 73.11%). That's like six months worth of progress in a quarter of a day - hot damn! Plus, there were some other cool "party favors" to be found, as well. The moral of the story here is don't let anxiety or concerns govern your life. Step out of your comfort zone and take a chance - you may be surprised with what you find! Your wife is awesome for talking you into going to the National. My wife did the opposite when I tried to go the the East Coast National in NY (about an hour from me.) Can't wait to see all the new Cubs you added to your CATRC collection. 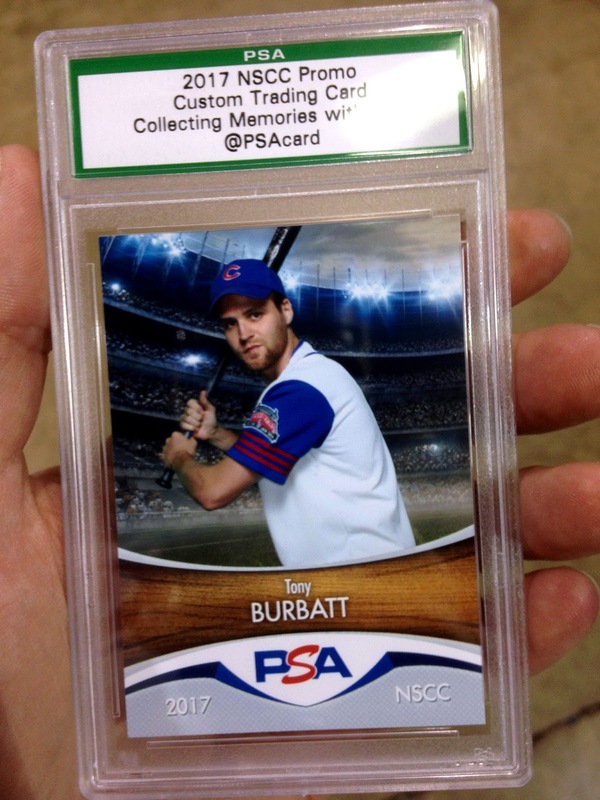 And your PSA-slabbed "rookie card" is a a very cool keepsake of your day at the National. Yay, Mrs. Burbs! That PSA card is fantastic... I can't wait to see the rest! Pretty cool! And great of your wife to talk you into it! It's going back to Chicago in 2019, plan accordingly, lol. Getting to a National is a "bucket list" item for me. Cleveland next year and I'm going to try for it. You guys are very lucky The National can't stay away from Chicago. I'd be there every time. Free that baby from its prison! Wow. Kudos to PSA for hooking up collectors with their very own slabbed card. That's easily worth the price of admission. I know you already know this, but I'll say it anyway: your wife's a keeper. Looking forward to seeing the haul! I see a Play Ball reprint in there -- I found a whole bunch of those from the very last table I hit today, you and I must've bought from the same guy at one point. Most of my day was spent at the discount boxes, and I can say that even I was sufficiently Dime Boxed Out by the end of it all. It's darn near impossible trying to cram The National experience into one day -- I definitely wish I had the time/energy/money to go back again tomorrow, as there were quite a few things I either didn't peruse as much as I would've liked or ignored altogether. As is the wonderfully overwhelming nature of The National, however. I talked myself out of going to The National, because of many of the same concerns you already expressed. I wish my wife would have spoken up like yours did. I can't wait to see what else you came away with!